Summer’s just begun, and the Pacific Northwest is already experiencing record-breaking high temperatures. We’ve been sweltering in 90 degree heat for days on end, and this is a city that is more familiar with rain than with this kind of hot streak. Luckily, we’re surrounded by water. My favorite way to beat the heat is hopping aboard a ferry for a day trip to a nearby island. 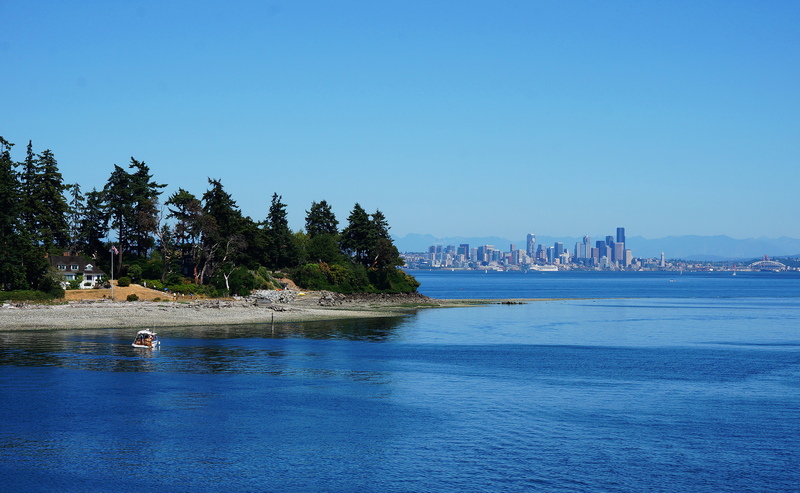 Bainbridge Island is a 35 minute ride from Seattle, and as soon as you step onto the ferry you’ll start to feel like you’re on island time. As you stand on the upper deck with the breeze blowing through your hair, you can watch as the city skyline slowly fades into the background. Soon enough, you’ll find yourself surrounded by water, sailboats and even a few stray seagulls catching a ride on your wake. A trip on the 4th of July included a parade, a vintage car show, and lots of great views. Do yourself a favor and walk on, or ride a bike. Not only will you save some money, but you’ll skip the lines and enjoy more time on the water, less time in your car. Even a normally skittish cat won’t budge in this heat. Am I in California, or Seattle? This heat has me confused.